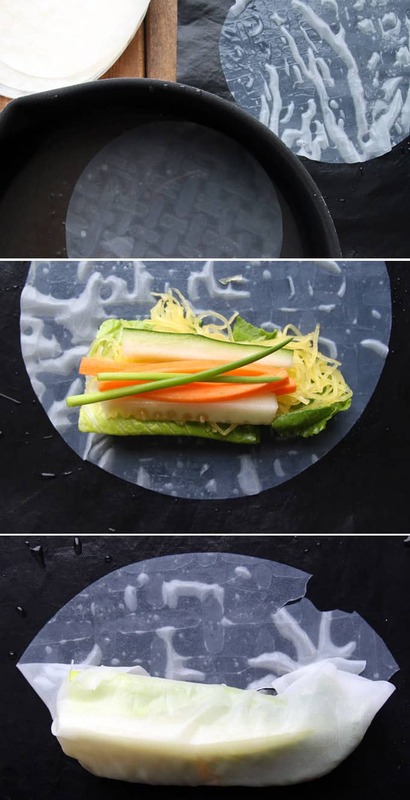 These Fresh Spring Rolls are filled entirely with veggies. 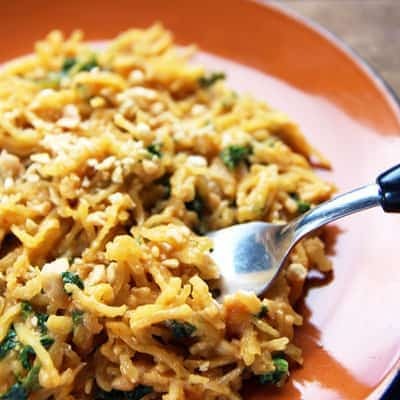 Spaghetti squash takes the place of rice noodles. They are perfect with a peanut dipping sauce. Fresh spring rolls are also called Vietnamese-style spring rolls, gỏi cuốn, salad rolls, rice paper rolls or summer rolls. And now you might be wondering, all these sound kind of out of season for December. But not my version. Often, you will see bean sprouts or rice noodles in fresh spring rolls. In place of those, I am using spaghetti squash which is very much in season right about now. This dish reminds me of living in SE Asia and all of the fond memories Konrad and I made while there. Living in different parts of the world truly changes your perspective, and often for the better. Talking to all you jet-setters out there. This isn’t even the first time I am using spaghetti squash instead of rice noodles. I find the shape and texture is pretty similar so it makes a perfect stand-in. You Ate Up The Previous Spaghetti Squash Recipe! I made this Spaghetti Squash with Thai Peanut Sauce recipe a few weeks ago and you guys absolutely LOVED it! With over 55K pins to date this must be my most popular recipe on Pinterest, ever!! In that recipe, I suggested using the leftover peanut sauce for dipping fresh spring rolls. When I set out to follow my own advice to make these delicious, raw salad rolls, I realized that I could also use some of the spaghetti squash I still had instead of the usual rice noodles. Working with rice paper – the wrapper in these rolls – can be a little tricky the first time. However, I realize it can be quite forgiving if you mess up a little (even a slightly torn sheet might roll up just fine due to its tackiness). And if you mess one up completely, it’s not the end of the world. Afterall, rice paper usually comes in big packs. For best success, you need to set up a little work station with all your fresh, cut-up veggies in reach, a large shallow bowl of warm water, and a flat surface like a plate or cutting board. I like to work with 2 papers at a time. I dip one in the warm water until it starts to soften but doesn’t get too squishy (about 10-20 seconds). It takes longer as the water starts to cool. Using both hands, spread the dipped rice paper on the flat working surface and let it rest while dipping the next paper. This little rest time allows for more water to be absorbed and the paper becomes more malleable. Set the second dipped paper out to rest while filling the first. I layered the veggies in the order of lettuce, spaghetti squash, cucumber sticks, carrot sticks and green onion. The order isn’t too important. Just using the lettuce leaf first helps to keep the other veggies together while rolling. And then you roll them up pretty much like a burrito. Fold over the short end, tuck in the sides and finish rolling. If you like, you could also add some protein to the veggies. Prawns or thin chicken strips would work really well. Then serve with peanut sauce for dipping. Boom! 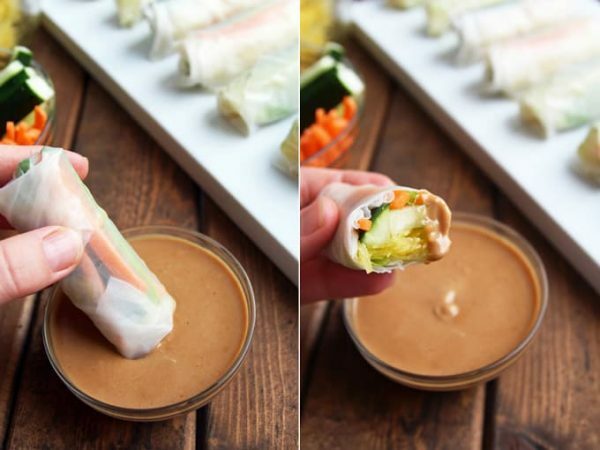 These Fresh Spring Rolls are filled entirely with veggies. Spaghetti squash takes the place of rice noodles. Perfect with a peanut dipping sauce! Start by roasting the spaghetti squash. Preheat the oven to 350 F. Scrape out the seeds from half a spaghetti squash. Rub it with a little olive oil and sprinkle with salt. Place cut side down on a baking sheet and roast for 25 minutes. Cool for 10 minutes, then use a fork to scrape out the spaghetti strands. Combine with minced garlic and set aside to cool. Prepare a work station with all your cut veggies within reach. Fill warm (not hot) water into a large, shallow bowl or pan. Dip 1 rice paper sheet at a time. Let soak until somewhat softened (10-20 seconds) but not limp, and place on a flat surface like a large plate or cutting board. 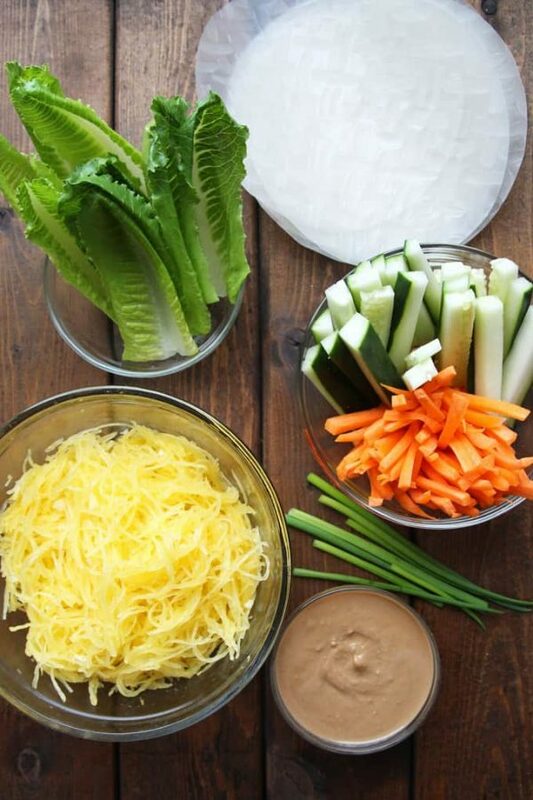 On one end layer your veggies - lettuce, spaghetti squash, a couple cucumber sticks, a few carrot sticks and some green onion/chives. Wrap like a burrito. Fold one end over, tuck in the sides and finish rolling up. Best served fresh, but leftovers could be stored in the fridge for a few days in an airtight container. I was looking for a spring roll recipe to introduce to my cooking class. This seems just right for them (they’re preteens). Thanks a bunch, they look delicious. These look awesome! I pinned them, and I can’t wait to share these in my Super Bowl recipe roundup. 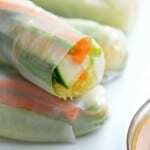 Love how easy and delicious these spring rolls are make! 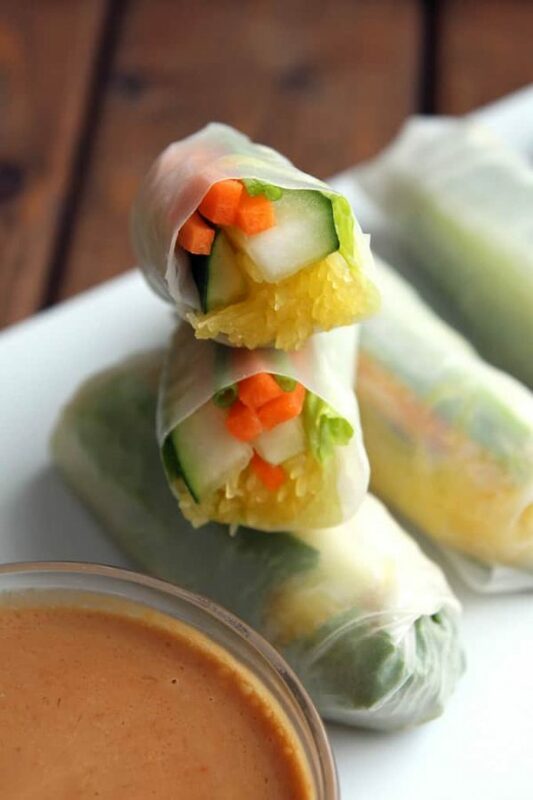 Think that they definitely will be perfect for lunch today – just need to get my hands on some rice paper so I can make the recipe! I totally adore the idea of using spaghetti squash in those spring rolls. They look so beautiful and I have no doubt that they are very tasty too, Regina. Ohhh, yummy-yum-yum! Very cool idea to add the squash to make them more seasonal. 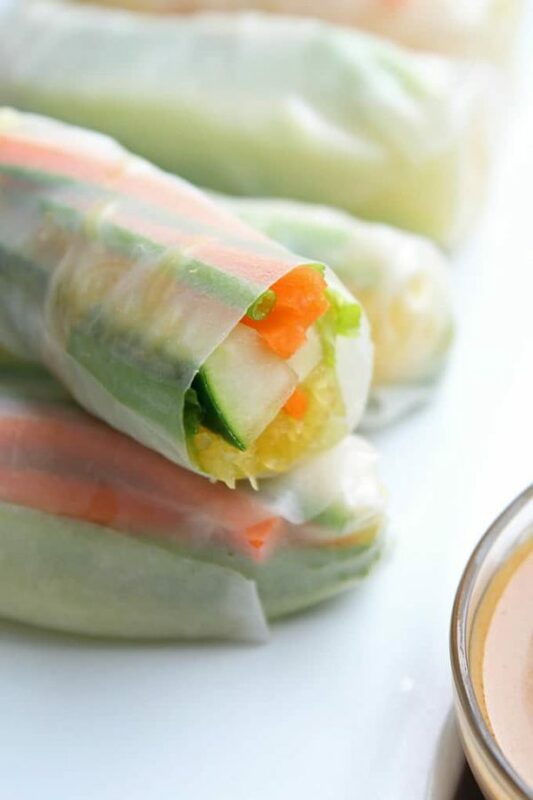 I do love me some Spring Rolls and may have to cut open one of the packages in my pantry for these.